Here at Signal, there is always a buzz of visitors coming in to learn about our platform and how it’s helping marketers around the world connect with real people. CEO Mike Sands – along with CTO Eric Lunt and CRO Marc Kiven – personally invests a lot of time supporting the local startup scene. Through his involvement in 1871, a Chicago nonprofit organization that provides resources to burgeoning entrepreneurs, as well as his own extensive contacts, Mike helps innovators network and serves as a sounding board for their ideas. Just last Friday, Mike rocked some of his Purple Pride. No, he wasn’t wearing any purple, but instead he welcomed 15 students to Signal from his alma mater, Northwestern University. The students, spanning freshman through seniors and a variety of majors, were thrilled to enter the Signal world from the moment they set aside their winter coats. 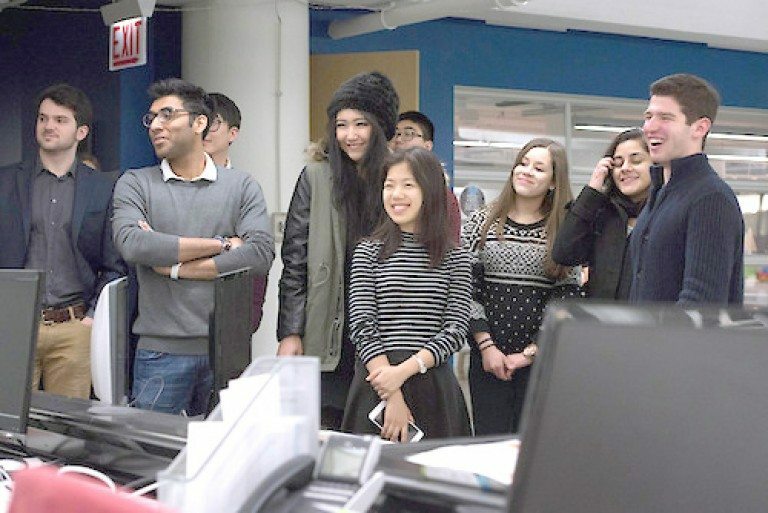 After receiving an office tour and grabbing some BBQ, the group of NU Wildcats were ready to hear about Mike’s career journey, which included time at Leo Burnett, GM, Orbitz, Pritzker Group and Signal. But while Mike’s wide ranging experience is clearly impressive, those in attendance were most interested in learning how to start and grow their own companies. Starting a company will take over your life, plain and simple. Mike said that can entail late nights, quickly adapting to change and frequent international flights. The passionate CEO also said that collaborating with people you trust is the key to alleviating stress and building a company more efficiently. He advised students to build strong bonds with other co-founders and executives to foster ideation and business development. Students were eager to learn about how to start their own businesses. Here, Mike was referring to The Garage, an innovation and entrepreneurship center on Northwestern’s campus where undergraduates have access to programming opportunities, mentors and resources to “experiment and take their ideas to the next level.” With thousands of students and faculty available for product testing, Mike said the days of dropouts like Jobs and Gates are waning. “Before, to start a company, your option was to quit school. Now, your option is stay,” said Mike, who loves it when resumes chock-full of startup experience appear on his desk. “99 percent of startups fail – so what? It’s all learning experience, and it only takes one idea to make it big,” he said. Finally, Mike told the students that one of the hardest things about starting a company is finding the initial clients that will provide the foundation to build upon. But, having vast networks to build on previous relationships can be vitally useful. That’s why, Mike explained, he values meeting students from local universities, especially his alma mater. Speaking of students tapping into their networks, Mike is eager to support emerging entrepreneurs. In fact, just this past October he spoke with a group of computer science and engineering students from University of Nebraska-Lincoln. Signal looks forward to working with more students and rising professionals. Thanks to Northwestern University Career Advancement for helping to plan and coordinate the event, and good luck to the 15 rising entrepreneurs who attended!